"We Synchronize your Aspirations with Reality". We are an amalgamation of professionals and entrepreneurs who decided to come together to aspire. 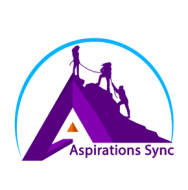 At Aspiration Sync, we help you acquire skills; perceive your future goals; innovate methods and strategies to reach there; reflect on your growth and empower oneself towards employ-ability. Today in times of Make in India, we are lacking in industry-ready skilled professionals. Here is where we, at Aspirations Sync come together to create that niche market where skills for a better India are developed. In this process of Learn to Earn, we at Aspirations Sync will synchronize your desire to your goals and your aspirations. We believe age is no bar for some skills which can not only enhance your chances of growth in a specific field but also help you climb the ladder of success. We are looking at diverse segments from school courses, entrances to skill development. Our ideology is to synchronize your goals to your aspirations. To see the youth molded into a force to be reckoned with. A new India that scales heights not just in theoretical pursuits but practical hands on knowledge. To see Aspirations Sync become the most sought after center for Training; where we don’t just make careers, but make lives. We see ourselves as a trend setter in creating industry-ready workforce. "I am glad to have been trained in this institute. Post completion on my Core and Advanced Python course, I have already started getting Freelance Projects. The trainer is highly experienced and skilled. All the best to you guys. " "It does not only gives you the technical knowledge but also prepares you accordingly to keep you up with the expectations of the industry through, it approach of live projects. A great place for the fresher's to start innovating their technical skills. " Aspirations Sync conducts classes in BCom Tuition, C Language and C Sharp. It is located in Nerul, Mumbai. It takes Regular Classes- at the Institute. It has got 3 reviews till now with 100% positive feedback.